Black Hawk Paint is a mechanically assisted series of action paintings that Wagenknecht started in 2007. She creates them with small-scale drone aircraft, and in the process, utilizes simple flight commands such as ‘barrel roll’, ‘take off’ and ‘land’. Among the most recent are works on vellum and canvas that incorporate heat- and UV-sensitive pigments. In her most recent versions, Wagenknecht plays with the notion of interactivity by removing all forms of electronics. 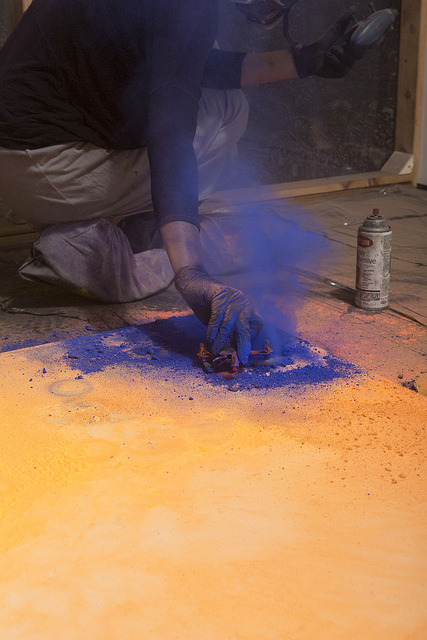 The pieces react to the changes of temperature and light within the exhibition space due to the pigments chromic elements. As a result, the works are always morphing and reacting to the environment, and as a result, no piece will never be the same twice.